In search of the perfect story to put a human face on a tragedy for his newspaper, my dad will fly into the eye of the storm. And now he’s heading to Ukraine, straight into the aftermath of a deadly earthquake. I don’t want him to leave. I don’t want to spend the week alone in a silent house with my mother, whose classically Russian reserve has built a wall between us that neither of us knows how to tear down. But I don’t tell him this. I don’t say stay. I think I’m holding it together okay—until the FBI comes knocking on our door. Now it’s all I can do to fight off the horrifying images in my head. The quake has left so many orphans and widows, but Mom and I refuse to be counted among them. Whatever it takes to get Dad back, I’ll do it. Even if it means breaking a promise…or the law. Calla Devlin’s sophomore novel offers a look into what happens to those left behind after disaster. The story begins with the poignant line, “My father specializes in devastation,” and from that point onward, readers are swept into Charlotte’s devastation. After her father leaves for the Ukraine following a deadly earthquake, Charlotte is forced to face her biggest fear: what if her father doesn’t come back home? Throughout this story, Devlin expertly crafts a story filled with heartbreak, grief, friendship, first love, and what’s more: the redemptive power of love amidst loss. It becomes clear early on that Charlotte’s father has always been the anchor holding her and her mother together. After all, Charlotte wants to be a photo journalist just like her father, and holds a place on the school newspaper with the hopes of following in her father’s footsteps. Without her father, Charlotte discovers her own creativity, and a pull toward a different kind of photography. Devlin uses this hobby to ground the reader in Charlotte’s every day life, while also characterizing her and her relationship with her father. Photography shapes the way Charlotte looks at the world, as well as the way she tells readers her story. But what proves most astounding, is just when the space between Charlotte and her father grows too wide, it acts as a force to rebuild a tumultuous mother-daughter relationship. Too often in YA, parents are nonentities or antagonistic forces, but Charlotte’s parents are loving, fractured, somewhat dysfunctional, and absolutely authentic. And through the lens of Charlotte and her mother processing the possible disappearance of her father, more rich history finds its way to the page, including the reveal that Charlotte once had a sister who died and whose presence still haunts the vey people they’ve become since. There seems to be a conscious echo between the way Charlotte believes her mother must view her, and perhaps the way Charlotte might view her mother if her father doesn’t return home. But instead of resentment and pain, there is a tenderness and all-consuming love that is exchanged between Charlotte and her mother. In much the same way that photography shapes the world of this story, so too does baking and Russian folklore. Some of the most intricate and rich details of this world come from the items Charlotte’s mother creates in the downstairs bakery with Tatya Nadine, who also helps shape this fictional world into one, which feels authentic. Charlotte’s mother’s Russian heritage lends a lyricism and deeper mythos to this story, which only works to add other characters to this world, that though inhuman, feel just as real as any person. While the bonds of family are tested within this novel, it becomes clear that they are not easily broken. The writing is beautiful, story all encompassing, and the fate of the characters is fulfilled. My only wish after spending so much time with Charlotte is for one more chapter. There are places I wanted to see, and adventures I wanted to live before leaving Charlotte behind. Right Where You Left Me’ is the story of Charlotte. Her mother is a Russian immigrate who works in the bakery downstairs from their apartment. Charlotte’s father is a larger than life newspaper reporter who loves to be the first on the ground during natural disasters. At the very begging of ‘Right Where You Left Me’, Charlotte’s father leaves for Ukraine to cover an earthquake. Her father soon becomes missing. Charlotte’s shared experience with her mother of worrying about Charlotte’s father draws them both closer together and further apart. I began reading ‘Right Where You Left Me’ the day before hurricane Irma hit here in Florida. It was an interesting surprise to find out that this story was about someone who covered natural disasters. I loved that this was a fresh topic that hasn’t been touched on much in YA. I think how a family reacts when a member is missing in a faraway place is a very interesting premise to explore. Some of the great elements of this story that I really enjoyed was the details about the baking. I also thought an important topic that is explored is that Charlotte has to deal with competing with her dead sister. My absolute favorite part was the few Russian folk tales that are peppered throughout the book. These were fresh stories that I never heard before. They made me want to read more east european tales. These folktales also helped to give an inside look into the state of Charlotte’s mind. Now for the elements that didn’t work for me. With the exception of Charlotte’s mother I really didn’t connect with any of characters. I just felt that were kind of flat and I really didn’t get a sense of who they were. For some reason I really didn’t like any of Charlotte’s friends (or the jerky FBI guy). I also felt like they were too involved in the story and just seemed like they were constantly mentioned. I also wasn’t crazy about all the photography stuff. I feel like half of the YA books I’ve read lately have inspiring photographers as characters and I just find the photography details to be boring. Finally, I felt like this should have been a short story and not a novel. It seemed so long for a 247 page book. All the action was at the beginning and at the end. The middle was just filled with the fluffy details of Charlotte’s everyday routines. 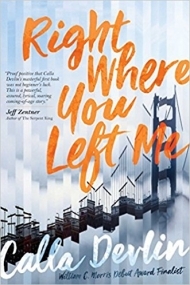 My final judgement is that despite being problematic in many areas, ‘Right Where You Left Me’ is a culturally rich and ethnically diverse novel with a unique premise. The storyline is timely and relevant in today’s world and worth a read.